The clank of metal gears and servos punctuates the listless desert wind. A neon sign flickers and buzzes. "Howd-y part-ner. Wel-come. To. Snake. Gulch," chirps a robotic woman in full cowboy garb. There are several such robots around, patrolling the tiny little parking area. "Visit. the. saloon," suggests another. I'm sort of pinning my hopes on this place. The rest of the desert is comprised of barren wasteland which is not worth looking at, much less saving. The only exception is the prison, which needs help. But the "good guys" are carpet bombing the place and I just don't see how wading in and punching people out before they're bombed is going to benefit anyone. After spending several surreal and unproductive days trying to help Millennium City, I don't dare go back to that madhouse . And I refuse to go back to Canada while Ravenspeaker is there. Those are my only options right now. 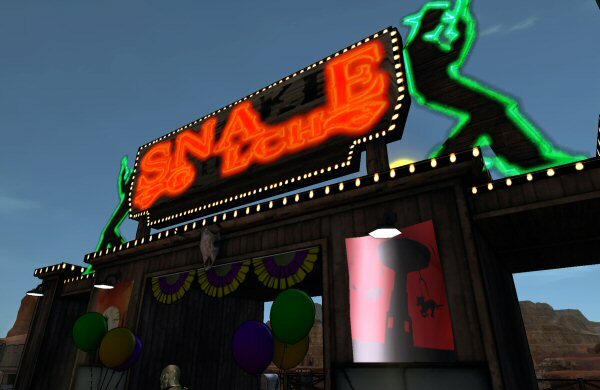 Basically, if I want to find a place where I can do good deeds and help improve the lives of my fellow citizens, Snake Gulch here is the only place left for me. "Howd-y part-ner. Wel-come. To. Snake Gulch," the robot says again. 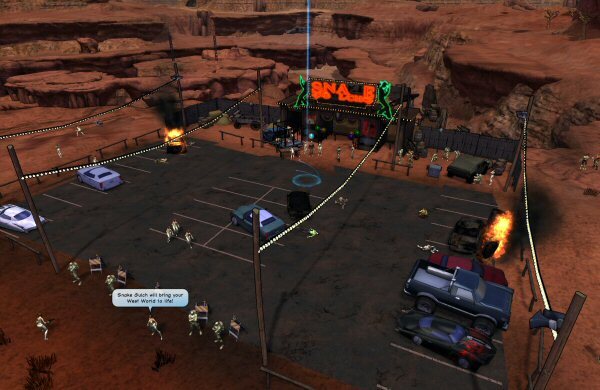 I walk around the burning cars and step over a few dismembered cowboy robots. The parking lot is about half the size of the parking area for your average McDonald's, which means it's about one thousandth the size of what you need at your average amusement park. What gives? Nearby is a man in a jacket and bowtie. I can smell a scientist nerd a mile off, and I have a suspicion he's my go-to guy around here. "HowdEE partNER!" he bellows. He has the voice of someone from MIT doing the world's worst Texan accent. "Ya'll can call me Wild Tyrell." "And you can call me Star on Chest. Right after you drop the accent." "Ah well," he says, slightly disappointed. "In that case I'm inventor Tyrell Donaldson, and this is my amusement park." "Inventor? Does that mean these robots are yours?" I ask, nudging a wrecked cowboy with my foot. "Indeed! Actually, I'm behind pretty much everything here at Snake Gulch." "And you've built an army of robots?" "Yes-sir!" he says, straying close to using his godawful "Texan" accent again. "They run the park. Run the rides. Handle security ..."
"And carry real firearms with live ammunition," I observe. "That they do," he says somewhat guardedly. "And now they've turned on you?" "So you heard about that?" he says brightly. "No. I was just guessing." "Well. I'm not sure what turned my robots to violence and evil. The ones here in the parking lot with me are okay, but the ones down there," he points a thumb over his shoulder, indicating the gulch, "will fill you full of lead for so much as lookin' at 'em. I don't know how it happened. One day the park was fine. The next, my Cowbots were shootin' up the customers. It doesn't make sense. They were foolproof!" "And what about these ones?" I point to the robots patrolling the parking lot, "You sure they're safe?" "No need to worry about them. They're foolproof!" I'm a superhero. It would be unseemly for me to sound angry and bitter towards a civilian. So I don't say anything. "How about I give you the tour?" Tyrell suggests at last.